My son presented me with what he considers to be the ultimate Father's Day gift: A pizza cone kit. And you know what? It's a pretty cool concept. What pizza lover wouldn't like to have a fun, portable method for eating pizza? Think of a pizza cone as a pizza pocket (calzone to us Chicagoans) with one end open. Only, it's smaller and more portable. We set our right away to make some pizza cones to enjoy for lunch. There was a bit of a learning curve involved, but, ultimately, I think we did pretty well. To start out with, you're going to need some pizza dough. For the ultimate level of fun, you should make your own, but refrigerated pizza dough from a can will work in a pinch. We went with some generic dough from Wal-Mart. If you use pizza crust from a can, then you'll want to make sure that you have some flour on hand. Pizza dough from a can usually comes out much too moist. Toss some flour on that dough in order to soak up the moisture so that it will be much easier to knead and cut the dough. Once your dough is prepped to your satisfaction, roll it out with a rolling pin. 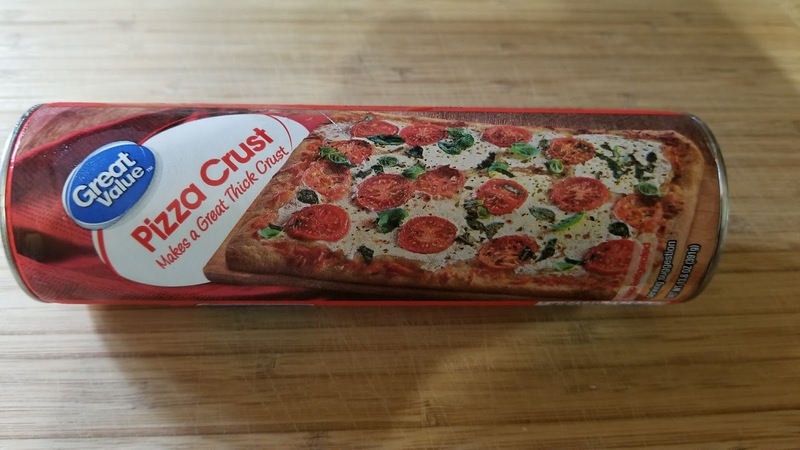 You're going to want to be careful here to make sure that it's thin enough to cook properly, but no so thin that your pizza ingredients will bust though the crust. Your crust will have to be wide enough to accommodate the dough shaper. We were eventually able to get two crusts cut out using the can of refrigerated dough that we had bought. 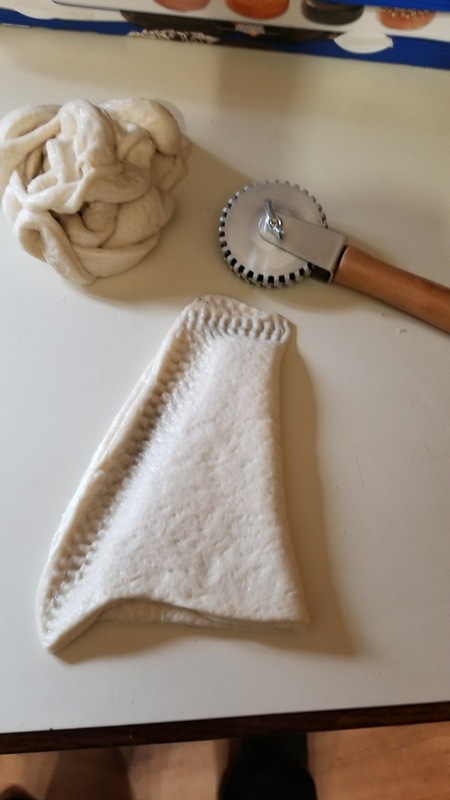 One you have your crust cut out, you're going to have to fold it over into a cone-like shape and crimp the open edges shut. Back when I worked at a mom-and-pop pizza place, we crimped the edges of our calzones by pressing down on them with a fork. Most pizza cone kits come with their own crimper, though. For extra stickability, moisten the edges of your pizza cone dough before your crimp them. What you'll end up with looks something like a Smurf hat. You'll have to carefully place your pizza cone crust around the cone shaper that is included in the kit. It can get very tricky here, so make sure you don't stretch the dough too much when you're doing this, otherwise you'll end up creating flaws or holes in your crust. 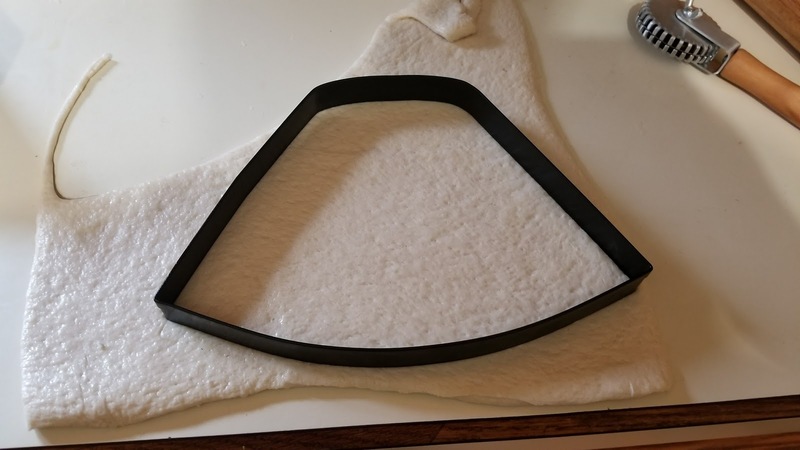 It'll probably take you a few minutes to crimp and shape your pizza cone crust, so this would also a good time to pre-heat your oven to 400 °F. Make sure you put your crust on a pan when you cook it just in case disaster strikes. 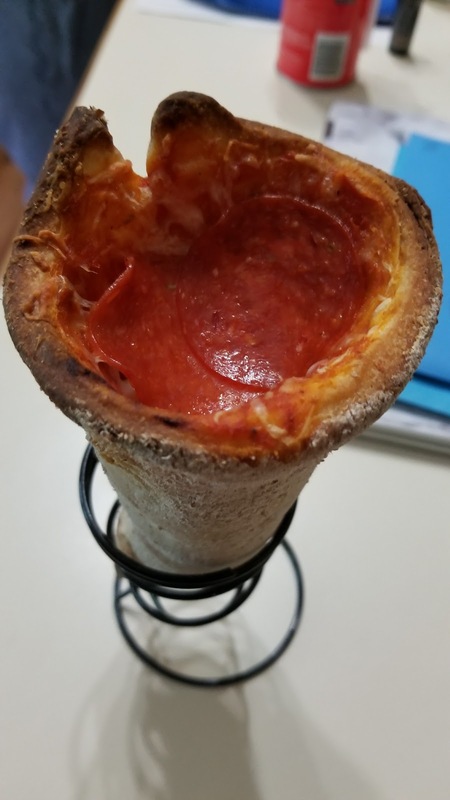 Our first attempt at making pizza cone crust was a failure. The dough was too moist and we rolled it out too thin in places. Gravity won out and pulled the crust down to the pan that we had set the cones on in the oven. 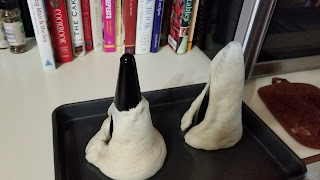 We were able to salvage these sorry excuses for cones by shoring them up with some of the unused dough. What came out wasn't very pretty, and was a bit chewy, but it worked and tasted fine. One you've cooked your pizza cone crust for about 8 minutes, get them out of the oven. Let them cool off a little bit before you start adding your favorite pizza ingredients. How you add your ingredients is up to you. I'm sure that there are a variety of different ways to handle it. Personally, I try to coat the entire inside of the cone with some sauce to begin with. Then, I fill the cone about half way with sauce, add my ingredients and then cover them with sauce. I add some more cheese and toppings to the top of the cone. Once you've got your ingredients in, place your cones on a pan (once again, to make sure that any mess from disasters is minimized) and put them back in the oven (you didn't turn it off, did you?). Baking time is going to depend on how many ingredients you put in the cone and how thick your crust is. Once your ingredients are golden and bubbly, it's time to take your cones out. Again, let them sit for a bit in order to cool off. Once you're done, you've got yourself a delicious portable pizza that you can hold in one hand, leaving your other hand free to hoist a beer or use the remote. Nearly 50 years after John Lennon released his classic song, "Imagine", his wife, Yoko Ono, is officially getting a co-writing credit on it. The surprise announcement was made at yesterday's meeting of the National Music Publisher's Association in New York City. During an interview in 1980, Lennon said that "Imagine" took inspiration from passages in Ono's 1964 book, Grapefruit and said that he should have credited the composition to Lennon-Ono. "There's a lot of pieces in it saying imagine this or imagine that," Lennon said. "I know she helped on a lot of the lyrics but I wasn't man enough to let her have credit for it. I was still selfish enough and unaware enough to take that contribution without acknowledging it. I was still full of wanting my own space after being in the room with four guys and always having to share everything". As a Beatles fan, I'm pretty ambivalent about this. Even if Yoko isn't my favorite person in the world, it's just a song writing credit. It doesn't change the message of the song or the musicality. I do, however, appreciate the irony in Yoko pushing for credit after threatening to sue Paul McCartney for wanting to change the writing credit on some Beatles songs to "McCartney-Lennon" rather than "Lennon-McCartney". Adding Yoko to the credits is also significant because it would extend the copyright of the song and keep it out of the public domain longer. A song enters the public domain 70 years after the death of its last songwriter. With Ono still being alive, the copyright for Imagine will still be generating royalty money for her great grandchildren to enjoy. One also has to be reminded of Paul's shenanigans with writing credits on his Ram album. Paul had been suing the Beatles at the time and, as a result, his royalties were held up in trust until the lawsuit was resolved. In order to generate some much needed revenue, Paul decided to give his wife, Linda, a writing credit on several of the songs he had been writing at the time. Paul explained, "Well, look! If my wife is actually saying 'change that' or 'I like that better than that' then I'm using her as a collaborator. I mean, John never had any input on The Long and Winding Road, and Yoko still collects royalties on it. You've gotta flow with these things. The joke at the time was that Linda was the only one getting paid in our household, because we were all held up with Apple being subject to litigation! I wasn't seeing any money.... Every businessman I had ever known was suing me. I felt, 'I'm damned if she's not gonna get paid for it; I'll put in a bill for her services!' They weren't major checks, but it was the only money we were seeing because she was the only one free of all contracts in our house". There's certainly a segment of die-hard Beatles fans who will take issue with this, especially in light of how Yoko has torn down John's legacy before while building herself up in the process. For example, Yoko's editing of the Madison Square Garden concert video in which she used the inferior matinee show rather than the superior evening performance. She also cut away from John during some of his better moments in order to feature herself pounding on the keyboard (which wasn't even plugged in). And there are a handful of Ono fans who will hail this as a great vindication of her talents. I think, though, that most of us are going to be taking the "not our monkey, not our circus" stance. I've certainly mentioned this before, but it bears repeating: If you get a call from a company claiming that they can lower the interest rate that you pay on your credit card, it's most likely a scam. The companies behind the sales pitches claim to have special relationships with credit card issuers, which supposedly is whey they can negotiate such low rates for you. They guarantee that the reduced rates they offer will save you thousands of dollars in interest and finance charges, and will allow you to pay off your credit card debt three to five times faster. In order to keep you from mulling over the offer for too long, they claim that the lower interest rates are available for a limited time and that you need to act now (if they have a special relationship, why would you have to act now?). Some even use money-back guarantees as a further enticement. Of course, you have to pay a fee up front in order to get in on the deal. The truth is, people who pay for these services don't get the promised interest rate reductions, don't save the promised amounts, don't pay off their credit card debt three to five times faster, and struggle to get refunds. It's also illegal for these companies to charge a fee to a customer before they settle or reduce your debt. So, if you're looking to reduce or re-negotiate your credit card debt, you're better off doing it yourself. And, I hate to say it, but if a company is outsourcing their call center to a foreign country that employs people who speak with very thick accents, you're likely dealing with a fly-by-night operation. Below is the latest recording of me telling a rep from one of these companies where to get off. I was half asleep last night at about 11pm when I heard my phone buzz. I looked over at it and saw the notification from Dominos that my order was on the way. I hadn't ordered anything in my sleep since that Ambien incident back in my college days, so I figured that the notification was a delayed e-mail from a previous order I had made from Dominos. I opened the e-mail and, sure enough, someone had ordered two pizzas at 11:06pm from a Dominos halfway across the United States from me. I thought perhaps the person who ordered accidentally used my e-mail address, as it's similar to a few others out there and is occasionally fat-fingered. I logged into my Domino's account to be sure and, unfortunately, someone had gotten into it, redeemed the two free pizza rewards that I had built up and made an order. What kind of world are we living in when someone will be petty enough to steal a man's pizza? "Yeah, I thought it was probably fake since your account is based in a different city and the name on the order is 'The Pizza Man'. We get about one of those per week". So, he suspected it was a falsified order, yet he didn't call the number listed on it to verify? Had he done so, he'd have been met with a non-working number and he could have then called my phone number which was still listed in the account profile. But, he's just a manager, and it's just a couple of pizzas and it's probably not worth the effort. I completely understand. Apparently, back in December of 2016, Dominos notified their customers that their MyDominos site may have been compromised and that everyone should change their passwords. I must have somehow missed that e-mail. Rather than filling up everyone's SPAM folder with those requests, Dominos should have made the change mandatory to all customers upon logging into their website. But, that obviously didn't happen. I called Dominos corporate this morning and got the issue straightened out and my pizza rewards refunded. Here are a few tips that you should use with every restaurant website in order to make sure that, if you ever do get hacked, the damage will be minimal. Redeem your rewards ASAP. If there are no rewards available, there's no reason to hack your account. One of the big selling points of the Samsung Galaxy S8 and Samsung Galaxy S8 Plus is that they are the first phones to feature the Samsung Desktop Experience (DeX). All you need to do is purchase the Samsung DeX station which is a hockey-puck looking dock that features an HDMI connection for display and sound, an Ethernet port, and two USB 2.0 ports. Unfortunately, if you usually keep your phone in a case of some sort, you'll probably have to take it off in order to put your phone onto the DeX Station. I'm sure Samsung will eventually remedy this by selling "DeX Compatible" cases for the S8 and S8 Plus. And forget about trying to use a generic USB-C adapter with HDMI and USB. I tried that. The Hoo Too adapter that I use to extend my Chromebook Plus screen to an external monitor and add USB devices doesn't do the job. Something must be embedded in the DeX Station itself must be triggering the phone to jump into DeX mode. DeX Station: Inspired By Wayne Gretzky? Kinda bland looking, right? Looks like Samsung is trying really hard to get you to use that piece of bundled bloatware that they call a browser by any means necessary. 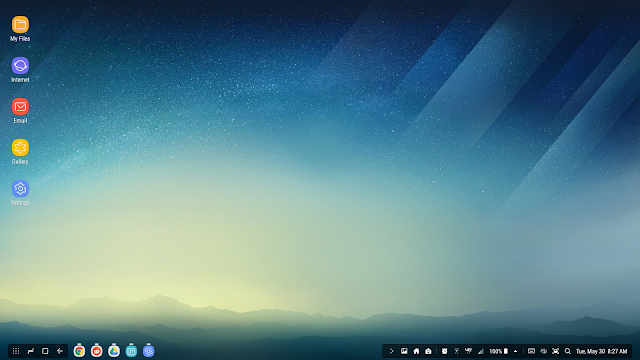 Not to worry, though, because you can customize your desktop by arranging icons, putting apps in the taskbar and changing your desktop wallpaper. Well, this really breaks my immersion. And it turns out that a lot of Android games aren't exactly optimized for playing with a keyboard and mouse. 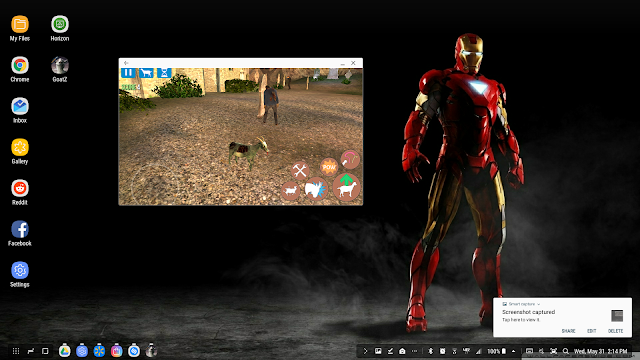 My poor goat couldn't get himself turned around via keyboard controls. With a few other games, I found that the mouse curser is too small to register as a finger-touch so many pop-up menus can't be dismissed. And Netflix hasn't yet caught on to what Samsung DeX is doing, so the Netflix app doesn't scale up to full screen either. You can try going to Netflix through Chrome but that will only kick you back over to the Netflix app. I suppose you could change your browser identification to make it look like you're coming from a Windows machine and that might work, but I didn't want to mess with that. In order to minimize these sort of compatibility issues, Samsung keeps a list of "DeX Optimized" apps, the Microsoft Office apps being chief among them. They open full screen with no problem, although the Android apps are just glorified web browsers wrapping around Office 365. And, for movies, Google Play Movies works great. Now, you might eventually ask what happens if a phone call comes through while you're on DeX. Well, the call will come in, you'll get a notification on the screen and you can answer the phone via speaker or bluetooth headset or you can pull the phone out of the DeX Station and answer it like normal. One further thing I feel the need to mention is that, after bombing out with Netflix, I tried to connect my Passport drive to the DeX Station so that I could watch some movies that I had ripped. It seems that the USB 2.0 on the DeX Station was powerful enough to nudge the drive awake, but, ultimately, my Passport drive wouldn't spin up and so DeX couldn't mount it. Bummer. It works just fine with my Chromebook Plus. There's probably a way around this, but I suspect that if I did manage to get DeX to mount the drive, VLC would not open up full size to play the movie anyway. 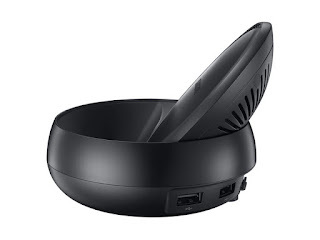 To sum the whole thing up, I'd say that, for right now, Samsung DeX is all work and no play. It's still a fairly new thing, but, if it catches on, more and more apps will come out with DeX support. 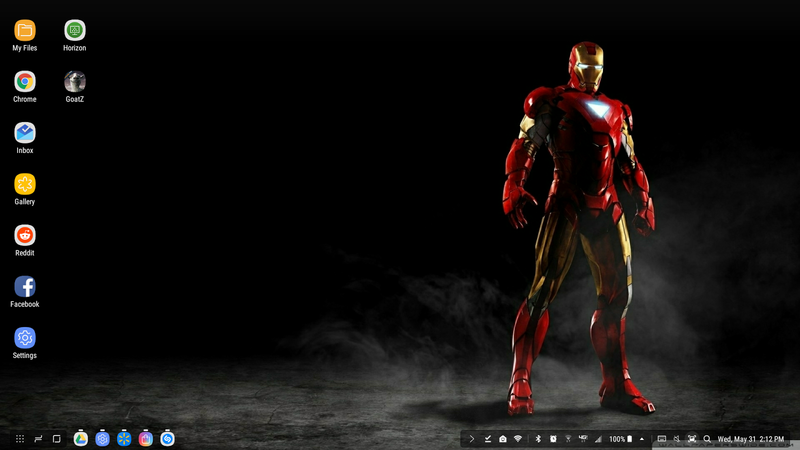 I think that once DeX starts to get a little more widespread support it'll be an amazing experience.